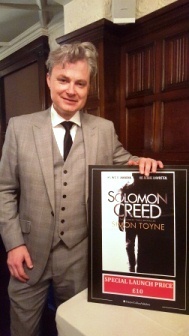 Simon Toyne’s fictional world is full of characters living in the shadows, hidden by intrigue and mystery. His latest novel, Solomon Creed, is first in a new series of epic thrillers and Susi Holliday meets Simon to talk about the new book and working for television. SJIH: Hi Simon, welcome to Shots! 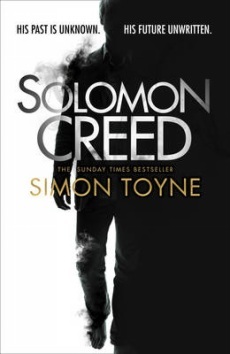 Your latest novel, Solomon Creed is out now after an intriguing publicity campaign. How does it feel? ST: It’s kind of a relief that it’s finally out there and also kind of terrifying for exactly the same reason. I’m always convinced that each new book will be the one no one likes. This one is a small departure too after the Sanctus trilogy, so that’s an additional worry. I’ve already had a few reviews that start ‘Having loved this author’s previous books I find this new one somewhat…blah, blah, meh.’ Love reviews, they really are the gift that keeps on giving. It’s about a man who seems to know everything about everything but nothing about himself. He’s on an epic journey to re-discover his identity and has to save the souls of others in order to ultimately save his own. You’ve set it in a small town in Arizona, called Redemption. Is this based on a real town? Did you spend much time in the desert doing research? Redemption is based on a bunch of real places. I’d been to Arizona a few times, enough to realise it would be a great place to set a story like this, and I went there again for a week’s research to try and find my town. A few places came close but none were exactly right so I ended up doing what I always seem to do and that is, build a place from the ground up, history, customs and all. It’s quite time consuming - I wouldn’t recommend it. I’ve done it myself, so can relate – you’ve done a great job of ‘creating’ it. What was your favourite thing about writing this book? My favourite thing was writing the character Mulcahy, a morally compromised ex-cop who now works as an enforcer for the cartels. Some characters just seem to arrive fully-formed and he was one. He was a joy to write. A few people have even asked if there will be a spin-off novel or series featuring him, which is an interesting and not altogether outrageous idea. Sounds great! Back to the main man though … Solomon Creed is a bit of an enigma, isn’t he? Do you know him inside out now? Or is he evolving as you go? That’s a very good question. The central mystery of the whole series is Solomon himself and who he is. I knew who he was before I started writing the book but that didn’t make him easy to write. He has a vast knowledge but no idea how he came by it so, in effect, he has no centre, no core and that’s actually quite hard to write. Normally you know someone’s core and write out from it. I had to figure him out as I was writing. I’m still figuring him out. Knowing who he is doesn’t really help with the journey any more than knowing the name of a city helps you get there quicker. Quite a challenge then. The book is being made into a film – is that right? It felt very cinematic to me. Very visual. Did you imagine it on screen while you were writing it? It’s been optioned by Leonardo DiCaprio’s company, Appian Way. They did the adaptations of Shutter Island and The Wolf of Wall Street, so they have a great track record of putting books on screen. They are now trying to expand into high-end television drama and Solomon Creed (The Searcher in the US) is part of that drive. I come from a TV background and am as much influenced by cinema as by books so I always pre-visualise everything when I’m writing and effectively describe what I’m seeing. It will be fascinating to see what someone else does with it. Indeed! So what’s next for Solomon Creed? Have you written the next book, or is this what you’re working on now? I’m writing the second book in the series now. I know some writers who are a book or even two books ahead but I’m most definitely not one of them. I don’t know whether it’s in my make-up to always have to be up against a deadline or whether whatever I’m working on has to feel immediate, but I can’t seem to motivate myself to start writing until I almost don’t have enough time left to do it. Oh yes… The book has been described as ‘Lee Child meets Stephen King’. Are these inspirations of yours? Did you always want to write this kind of novel? I’m a huge admirer of both of them, though Solomon Creed was actually inspired more by the great Hollywood Westerns and the classic samurai movies than anything else. I’ve always wanted to write a Western, and now I have, sort of. Ha! You worked in TV before you became a novelist… how did that experience help when you started writing? It taught me discipline and structure and pace. It also made me appreciate the value of reworking things. TV is brutal, you come up with something and a bunch of people march in and kick it to pieces. Publishing is far more genteel, my editors (UK and US - I’m published by HarperCollins in both) compare notes then ‘suggest’ changes rather than demanding them and their suggestions are always considered and smart. In TV you get people half-watching things while they’re on their phones, then they look up and say things like ‘HATE that music’ and ‘why has that man got a beard, can we lose the beard?’ Writing novels for a living is like escaping from some kind of vicious public school that thinks everyone beyond the walls are idiots. Brilliant! What’s the most exciting thing about being an author? Are there any downsides? Do you have any advice for anyone just starting out? The most exciting thing is that, creatively, you can do anything. There are no budget constraints in a book. The downside, for me anyway, is that it’s very solitary and it takes ages. I think coming from TV, which despite the idiots and talentless presenters I sometimes had to endure, was more collegiate and noisy and quicker. I struggle with the quietness and the solo endeavour of writing a book. I think for anyone starting out I would say enjoy it. You only get to write your first book once and it’s incredibly liberating. Don’t fret too much about what may happen to it like I did, I spoiled it for myself by being so anxious. Great advice. What have you enjoyed reading recently? Who should we be keeping an eye on in the crime and thriller world? The last book I read that I got evangelical about was The Son by Phillip Meyer. It’s not really a crime book, but there are plenty of crimes in it. I think Ryan John Jahn is a brilliant writer too who should be read more widely. And everyone should read Natchez Burning by Greg Iles, it’s a masterpiece. Three more to add to the list, then… And finally, the question that I ask everyone… What does no one ever ask you that you wish that they would ask you? Oh that makes me happy too! Thanks, Simon. It’s been a pleasure talking to you. Best of luck with Solomon Creed – I’m looking forward to the movie! Thank you. I’ll invite you to the premiere.